There's a fascinating, very short report out in JAMA marking the first case where text messaging abnormalities were the first signs of a neurological abnormality. "As the accessibility of electronic communication continues to advance, the growing digital record will likely become an increasingly important means of identifying neurologic disease, particularly in patient populations that rely more heavily on written rather than spoken communication." While this is a cool presentation of modern technologies encroaching upon the medical world, what's fascinating to me, from a neuroscientific perspective, is the location of her stroke and its effects. 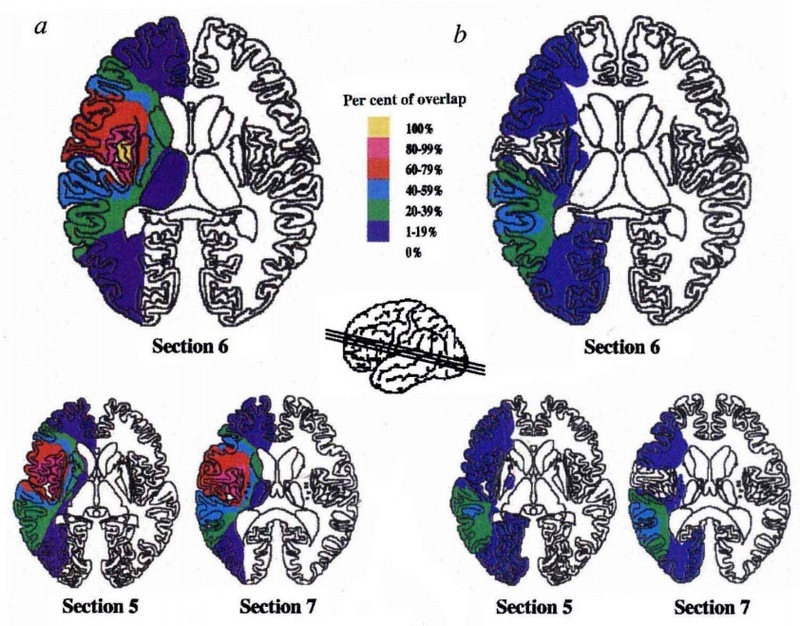 In 1996 Nina Dronkers scanned the brains of 25 patients with apraxia, or the inability to coordinate speech movements, and found that 100% of the patients had lesions in only one spot: the left insula (which was also found to be lesioned when she performed MRIs of Broca's original patients). 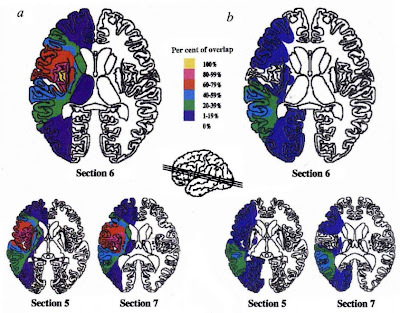 This is an old argument, but provides strong evidence that the insula is an important player in coordinating speech movements. Even if that "speech" is actually just texting on your iPhone. "As per medical radiological tradition, the right side of the brain image represents the left side of the patient's brain, because they flip them (supposedly because that's how they see the patients when they're facing them?)" You're looking at the brain from below. The rostral/anterior part is facing upwards and the caudal/posterior part is facing downwards. If the picture was three-dimensional, the ventral/inferior region of the brain would be facing towards you and the dorsal/superior region of the brain would be facing away from you. Correct. But, for radiology, coronal slices are presented as anterior being the "closest" to the viewer with the brain's left being in the viewer's right hemifield, as though you were looking directly at the patient. For that reason all other orthogonal views are presented similarly. You always post the most interesting things!